. Pull up some shade and hydrate: Move into the shade between 10:00 a.m. and 2:00 p.m. when temperatures and UV levels are at their peak and be sure to drink lots of water to keep both your skin and eyes hydrated.
. Pick proper specs: When purchasing sunglasses to protect your eyes, be sure to select lenses that safely block both UVA and UVB radiation.
. Consider photochromic lenses: Photochromic lenses are the most convenient choice for prescription lens wearers and offer superior eye protection.
. Cover up if you plan to snooze: Lying down with your eyes closed can cause sunburned eyelids, so be sure to cover your face entirely if there's a chance you'll fall asleep in the sun.
. Check your UV index: Whether you're at the cottage, the beach or just in the backyard be sure to check the daily UV levels in your area and plan accordingly. 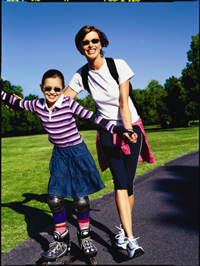 More tips about healthy sight are available online at www.transitions.com. The summer months are upon us and with the longer sunny days come harmful and damaging UVA/UVB rays. This summer, here are some tips to keep in mind while enjoying the great outdoors. 1. Stay in the shade. Studies show that aging skin has much to do with sun and environmental damage. The sun is strongest during the mid-day, so if you're planning to be outdoors, find a treed, shady area for these peak hours. 2. Apply sunscreen. Many of us are now aware of the dangers of tanning to our skin. Even if you've tanned in the past, it's never too late to change your routine and prevent future damage. Always use a broad spectrum sunscreen like Aveeno Sunblock Lotion SPF 45 which will help to protect from sunburn. Also, look for moisturizing formulas that contain soy and vitamins A, C and E to keep skin soft, smooth and protected. 3. Keep kids protected. School's out and many children are spending their days outside. Safeguard your little one's skin with all the proper gear. For spontaneous outdoor activities, keep a sun care preparedness kit handy with a hat, sunglasses and kid-friendly sunscreen, like Aveeno Baby Sunblock Lotion SPF 55. Send in your Sun Safety Tip!! !